Watch those options, and stick to the 128i if you want to keep your budget down. It's easy to option up a 2009 BMW 1-Series to the levels of BMW's larger 3-Series, so sample both before your pen hits the paperwork. Has the 3-Series become too portly, expensive, and upscale? If you think so, the 2009 BMW 1-Series might make you happier. To bring you the very best possible review of the 2009 BMW 1-Series, TheCarConnection.com has combed the Web and gathered insight and opinions from other reviewers. The editors of TheCarConnection.com have also driven the 1-Series and incorporate their own experiences, combined with knowledge of the market, here in this definitive Bottom Line. The 2009 BMW 1-Series represents basic BMW at its best: It has design ties to 2002 and goes all the way back to the 1960s. Over the years, BMW's 3-Series line has evolved to the point that bigwigs recognized that the brand included a big gap at the lower end of the automotive spectrum. The goal of the 1-Series is to fill that gapâ€”with new coupe and convertible variants. The 1-Series shares the long hood/short deck of the 3-Series, but the 1-Series is smaller. Its 104.7-inch wheelbase is 4 inches shorter than the 3-Series Coupe, but its truncated shape is shy of its bigger sibling by half a foot. Overall width is almost 3 inches narrower. Two models are offered for each body style: 128i and 135i with a choice between 6-speed manual and automatic transmissions. 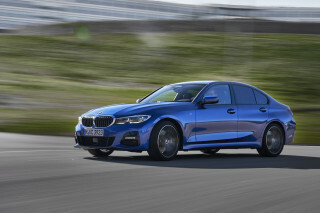 The primary difference between the two is in the engine; the 128i makes use of a non-turbo 230-horsepower variant of BMW's 3.0-liter inline 6-cylinder, while the pricier 135i delivers 306 hp from its twin-turbocharged version of the engine. BMW also uses these engines in its 3- and 5-series models. The lates BMW 1-Series handles exceptionally well, steers like a proper sports car, and even functions nicely as an occasional use four-seater. There's even good cargo space in the convertible thanks to the top's compact mechanism. That said, the 1-Series isn't a lot cheaper than the equally solid 3-Series, especially once a lot of options are added. Inside, the dimensions are reasonablyctorily generous, but the rear is bit more snug compared to the 3er. There is room in the back, but what do you expect, really? It's sufficient for occasional use. In a nod to practicality, the rear seat back of the 2009 1-Series includes both pass-through and 60/40 split-folding access to the trunk. Interior accommodations in the 2009 BMW 1-Series are what you've come to expect from BMW of late: less austere and more attractive while remaining easy to useâ€¦with the notable exception of iDrive. The revised iDrive software is better than before, but it remains stifling at first encounter and often counterintuitive with experience. The interface, however, now communicates directly with USB-based MP3 players. All other major controls make perfect sense and are well positioned for easy use and/or viewing. A navigation system is optional. 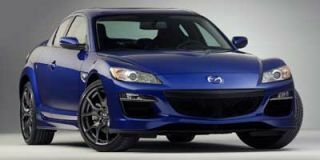 2009 brings an optional heated steering wheel and a redesigned iDrive system. The interior of the 2009 BMW 1-Series is unmistakably excellent. The exterior is a love-it-or-leave-it proposition. Experts at TheCarConnection.com find that the 2009 BMW 1-Series definitely looks like a BMWâ€”but it's not as elegantly proportioned as others in the family. The BMW 1-Series was new to the United States for 2008 and it returns for 2009 as either 128i or 135i models, both of which can be had as either a two-door coupe or a convertible. Autoblog delivers a backhanded compliment to the 1-Series, commenting, "the styling language of the new 1-Series coupe is more attractive in person" than photos suggest. The styling of the 2009 BMW 1-Series seems to win some and lose some. Road & Track feels that the BMW 1-Series "is more in tune with E36-based coupes, the two-generation forebear of the current 3 Series." BMW, however, claims that the basis for the styling of the new BMW 2009 1-Series is the old BMW 2002 model. For 2009, BMW offers no changes to the 1-Series' styling other than a new exterior color. Cars.com considers the new 2009 BMW 1-Series is "awkward" and finds certain aspects "bulbous" and "out of tune" with the rest of BMW's lineup. They also say that the "1 Series isn't overtly striking in the visual department," and even that it "seems hum-drum...even in sporty 135i duds." While generally approving of the styling on the new 2009 BMW 1-Series, Road & Track also notes that its long hood and tall roofline can look "almost ungainly... from some angles." If nothing else, the exterior styling is divisive; for every person who loves the 1-Series' look, there is another who finds it a complete turnoff. Inside, the new BMW 2009 1-Series features traditional BMW styling, which is to say that the car is very clean and upscale. Popular Mechanics comments that the 2009 BMW 1-Series is "nearly identical to the 3-Series," which is a solid stamp of approval. ForbesAutos raves about the 1-Series Coupe's interior, finding it "simple and tastefully styled" and that it has been "crafted from premium materials and with instruments that are well positioned within sightlines." ConsumerGuide feels that while the "audio and climate controls are mounted somewhat low," they are still "easy to reach and simple to decipher and adjust." The 2009 BMW 1-Series is nimble, quick, and fun to drive. Editors at TheCarConnection.com consider the 2009 BMW 1-Series unabashedly sporty, quick, and fun to drive. The 2009 BMW 1-Series is moved by a naturally aspirated 230-horsepower engine on the 128i models, but performance fans will want the twin-turbocharged, 306-hp 3.0-liter inline-six version on the 135i. With either trim, Edmunds states that "a six-speed manual is the standard transmission, while a six-speed automatic with manual shift control is optional." Performance overall is quite goodâ€”and Popular Mechanics notes that "the flip side of all that high performance is usually poor fuel economy." But not here, they say: The official EPA figures for the 2009 BMW 1-Series are 18 mpg city and 28 highway for the entry-level 128i, while the extra-cost 135i returns 17 mpg city, 25 highway. Road & Track reports that the 135i "has amazing pulling power" and gives "new meaning to the term 'pocket rocket.'" Some reviewers, however, worry that the car's 3,500-pound weight will overwhelm the engine. However, despite its weight, Car and Driver finds the BMW 1-Series to be "pretty quick, taking an estimated 6.4 seconds for the 0-to-60-mph run equipped with the fluid six-speed manual." For those seeking a serious performance machine, the 135i gets a twin-turbocharged engine that, according to some reviews read by TheCarConnection.com, moves the car to 60 mph in less than 5 seconds. ConsumerGuide praises the 2009 BMW 1-Series' performance, claiming that "BMW's legendary handling capability carries over to the 1-Series. 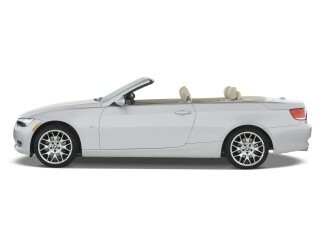 Even BMW's 2009 128i convertible with the base suspension and 16-inch tires exhibits little body lean in fast turns." Popular Mechanics finds, on the track, "the steering, typical of BMW, [is] sharp and quick to react." Edmunds says "body roll is minimal, and overall grip on models fitted with the sport package is superb." Kelley Blue Book raves about the "huge front brakes that not only slow the small coupe with ease but also look great" on the 135i. The brakes on all trim levels of the 2009 1-Series are exceptional, and they hold up well under extreme conditions. Ride quality on the BMW 2009 1-Series is a function of trim level and available options, but there aren't really any surprises here. ConsumerGuide finds that "the tested 128i convertible [rides] surprisingly well, easily soaking up smaller road blemishes and pavement heaves." However, opting for the 135i brings a sport suspension and larger wheels, "a combination that reacts much more sharply to bad pavement, yet never feels harsh." Customers should expect that the 135i in full sport mode will feature a rougher ride than the 128i with more comfortable settings. BMW has managed to offer excellent-quality materials even at the lower end of its model lineup. Drivers expect excellent quality from the BMW nameâ€”and the editors at TheCarConnection.com are no different. The 1-Series does a good job of living up to BMW's standards. The BMW 1-Series, as either a coupe or convertible, is designed to seat four. ConsumerGuide finds that the front allows "ample room for adults on comfortable seats." As expected in a car of this size, the rear seat gets mixed reviews. ConsumerGuide reports that the backseat offers sufficient room for two four average adults. The reviewer adds a caveat, however: "any front-seater over 6 feet tall will delete rear legroom behind them." Additionally, "elbow space is very tight in the coupe and even less in the convertible" for rear occupants. Reviewers at Kelley Blue Book characterize the seating in the back of the BMW 1-Series as "comfortable but cozy." The BMW 2009 1-Series defies its small dimensions when it comes to interior space. The coupe versions of the BMW 2009 1-Series have a trunk that "offers a reasonable 10 cubic feet of storage space," according to Kelley Blue Book, and if additional space is needed, "the rear seats can be folded to accommodate larger items." Motor Trend approves of the storage space on the convertible, finding that "because it's a fabric roof rather than a rigid folder, it doesn't swallow too much trunk space." Aside from trunk space, there's not much storage room on the 2009 BMW 1-Series, as ConsumerGuide notes that "interior storage is limited to a small glovebox and smaller console box, along with a tiny console bin and map pockets." Materials quality has never been much of an issue on BMWs, so it's no surprise that the interior of the BMW 2009 1-Series is well constructed. Kelley Blue Book attests the "interior treatment of the 1 Series is anything but cheap." Edmunds says, "Despite being the cheapest BMW sold, the vehicle's interior materials are consistent with its larger and more lavish siblings." ForbesAutos appreciates that the interior is "crafted from premium materials." Cars.com, however, remarks that on BMWs 2009 1-Series "the leather is less luxurious" and the "plastic also seems to be a lower grade in a few places" compared to the 3- and 5-Series BMWs. Solid build quality contributes to the low level of ride noise, which ConsumerGuide says is "well checked" and that it's possible to have a conversation with the top down. Motor Trend, however, observes that the convertible top "generates wind noise." The 2009 BMW 1-Series offers all the expected safety features and manages to pull some tricks out of its sleeve. The 2009 BMW 1-Series doesn't have crash-test scores on the books yetâ€”but it does have plenty of safety features and BMW's reputation for quality in its corner. Editors at TheCarConnection.com believe the 1-Series to be a smart pick for safety. Kelley Blue Book points out that the BMW 1-Series offers "standard front, front-side and side-curtain airbags, anti-lock brakes, stability and traction controls." These are features that consumers have come to expect from automobiles todayâ€”and BMW's mix of standards and smart surprises pleases most drivers. ConsumerGuide praises the 2009 BMW 1-Series' "antiskid system, tire-pressure monitor, [and] daytime running lights." Visibility is generally good in the 2009 BMW 1-Series. ConsumerGuide finds that on the BMW 2009 1-Series, "thin pillars in the coupe provide fine visibility to all directions, though wide front headrests can get in the way when backing." Visibility is considerably worse on convertibles. The 2009 BMW 1-Series has a swanky set of standard equipment, but adding options can quickly push the vehicle out of many buyers' budgets—or into the range of the 3-Series. 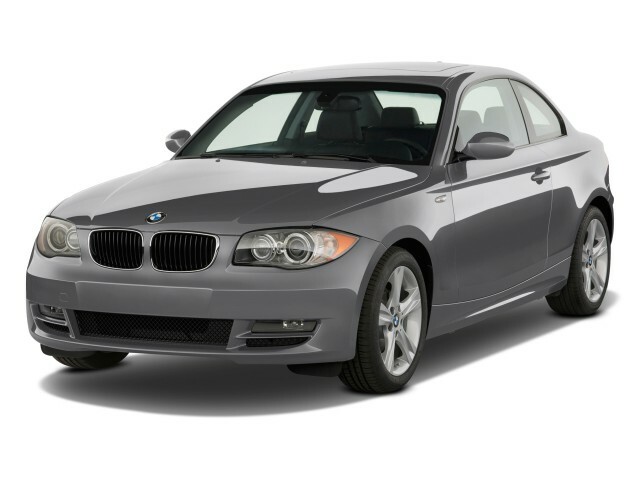 Experts at TheCarConnection.com love the features that come standard and optional on the 2009 BMW 1-Seriesâ€”but the greater the features, the greater the price. The two available trims of the BMW 1-Series, the 128i and 135i, come with similar standard features. ConsumerGuide reports that the BMW 2009 128i offers standard "air conditioning w/ automatic climate control," as well as "remote keyless entry" and a "power sunroof" on the coupe, while the convertible can be outfitted a "power convertible top." ForbesAutos finds that the BMW 1-Series "comes well equipped with most essential amenities, including an input jack on the standard audio system for connecting iPods and other portable devices." A new heated steering wheel is also available for 2009. Kelley Blue Book mentions that the BMW 1-Series offers "rain-sensing windshield wipers, cruise control and a 10-speaker audio system." Also, the BMW 2009 1-Series convertible features a folding cloth top that operates at speeds of up to 30 mph, a welcome addition for those who are tired of pulling over every time the sun comes out. Optional features are pretty impressive on the 2009 BMW 1-Series, but they have a serious effect on the price of the car. While the 2009 BMW 1-Series is marketed as a well-equipped entry-level BMW, Road & Track notes that if you "throw on a premium package...you're in the neighborhood of $39,000." Some drivers may not even be interested in the pricier add-ons; as ForbesAutos warns, "ordering [the GPS navigation system] can actually make the car less user-friendly, as it comes with BMW's somewhat confounding iDrive system." The iDrive system has been redesigned for 2009, but it may still frustrate some.